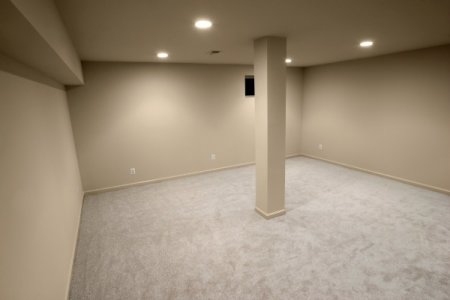 No matter how nicely the rest of the basement is finished, if the floors are cold and the room feels damp, nobody is going to want to spend much time down there. It's a common problem in a finished basement because concrete floors continually release moisture (making a basement feel damp) and they act as a conductors of cold from the ground under the foundation. In the past, people have tried to address the problem by laying down a wooden sub floor before installing their basement flooring, but over time a wooden subfloor in direct contact with the damp concrete will degenerate. And the wood doesn't do anything to prevent moisture, so the room still often feels damp. Fortunately, the construction industry has come up with a solution for cold, damp basement floors--floating sub floor systems. There are a number of manufacturers of these systems but they all work essentially the same way. They create a moisture proof air gap between the concrete floor and the basement flooring. They are usually built from either plywood or oriented strand board (OSB), bonded to a corrugated underlay in 2-foot by 2-foot tongue and groove panels that fit tightly together. A floating sub floor keeps a basement floor warm and comfortable. The underlay (made from heavy duty polyethylene or styrofoam insulation) creates an air gap under the plywood surface (and above the concrete) so no wood ever touches the concrete. As a result, the wood can't get wet and rot over time. Plus, the air gap allows air movement under the floor that will dry any moisture coming up through the concrete and at the same time the moisture proof underlay acts as a barrier to stop damp from rising into the finished room above. So, there is no dampness and no musty odors in the room. With the basement floor now warm and no odors or dampness in the air, a finished basement with a floating sub floor system becomes quite livable. Manufacturers claim the engineered wood floor won't warp, split or peel and the panels are strong enough to even support heavy furnishing or things like a treadmill or a pool table. Most back up these claims with warranties of up to 25 years. You can install carpet, laminate or engineered flooring and even ceramic or vinyl tiles on top of the panels. (Vinyl tiles require a 1/4-inch plywood sub floor while ceramic tiles need a base of cement board). The floating sub floors are even comfortable to walk on, since the soft underlay has a little "give" to it so the floor softens each step. The panels must be installed on a level surface, so the basement floor must be leveled before you can install the panels. The panels are about 1-inch thick, so in some basements that don't have much head room, raising the floor even an inch can create a problem. Over all, a floating subfloor will help make your basement a liveable and comfortable space.